As a companion animal veterinarian practicing in suburbia on the mainland of Australia I rarely encounter Tasmanian devils. But I know a little about them due to the emergence of Devil Facial Tumour Disease (and a little warning, I will be showing a photo of an afflicted Devil later in the post). Professor Kathy Belov gave an excellent talk about Devils at the HARN seminar yesterday and I learned about a gazillion things. The Devil has had the honour of being the largest marsupial carnivore since the thylacine (aka Tasmanian tiger) became extinct in the 1930s. Adult males weigh 7-13kg, females 4-9kg. They are marsupials, so give birth to underdeveloped young that live in the mother’s pouch for an extended period, living off the mother’s milk (which Prof Belov’s team is currently investigating for the presence of antimicrobial peptides). The breeding season is February-March and gestation is 18 days (imagine that...not enough time to paint the nursery!). Females give birth to 20-30 young but only have four teats – so the first four to attach tend to survive (and four neonatal Devils will fit easily onto a 20 cent coin). Females may mate with multiple males and have mixed litters (different littermates have different fathers). 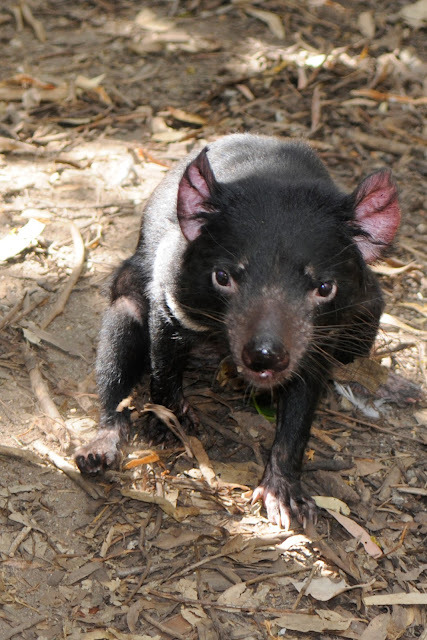 Devils used to be found on mainland Australia but that population was lost around 3K years ago. DFTD is an infectious and contagious cancer passed on during biting which can occur during mating or feeding. The majority of primary tumours occur around the face (causing the classic disfiguring lesions), and often interfere with eating so these animals starve. Around 60 per cent will suffer mets and due to organ failure. It emerged in the North-east of Tasmania and was first reported in 1996 by a wildlife photographer who took photos and reported the tumours to the authorities. Since then, 85% of the total population of devils has been lost, and 95% of the population on the East coast of Tasmania. Strangely enough, no local extinctions have occurred…so the emphasis has shifted from talking about managing extinctions to managing populations where the disease remains persistent. DFTD is restricted to devils, requires direct contact to be spread, and has an unknown incubation period – but “healthy” devils that have been introduced into captivity have developed the disease up to twelve months later. So wild devils are now quarantined for 15 months before being introduced to disease free captive populations. There is no diagnostic test that detects subclinical infection – once lesions appear they are almost always fatal. DFTD is a disease of adult devils: it does not effect juvenile devils. The youngest reported case occurred in an 18 month old devil, with most cases reported in animals over 2.5 years old – does something in their mother’s milk protect them? Every tumour has the same chromosomal arrangements. Investigators have traced it back a devil in which an event lead to a chromosomal change – a schwann cell in a female devil. That cell line has remained stable and passes from animal to animal – so far killing about 100,000. One reason devils are so vulnerable is that they are effectively immunological clones. That is they lack variability at the Major Histocompatibility Complex (MHC). [The MHC is the most variable region of the genome, containing around 200 genes in vertebrates. It is expressed on the surface of cells and presents self and foreign peptides like viruses and bacteria to the immune system]. DFTD seems to switch off the MHC molecules, so that the cancer cells do not trigger an immune response. While one of Professor Belov’s students has found a way to restore the expression of the MHC – albeit briefly – the use of this innovation in a vaccine is unlikely to save the devils. According to Professor Belov, their biggest hope is “on the ground management of populations”. She says that we need an enduring and ecologically functional population of devils in the wilds of Tasmania. There are around 33 organisations involved, including the Tasmanian Government, Zoo and Aquarium Association Australasia, Adelaide Zoo, Australia Zoo, the Australian Reptile Park, Ballarat Wildlife Park, Cleland Wildlife Park, Currumbin Wildlife Sanctuary, Devils at Cradle, Dreamworld, Gorge Wildlife Park, Halls Gap Zoo, Healesville Sanctuary, Lone Pine Koala Park, Monato Zoological Park, the National Zoo and Aquarium, Moonlit Sanctuary Wildlife Conservation Park, Perth Zoo, Symbio Wildlife Park, Taronga Conservation Society, Tasmania Zoo, Tidbinbilla Nature Reserve, and Trowunna Wildlife Park. Saving a species is a huge effort.